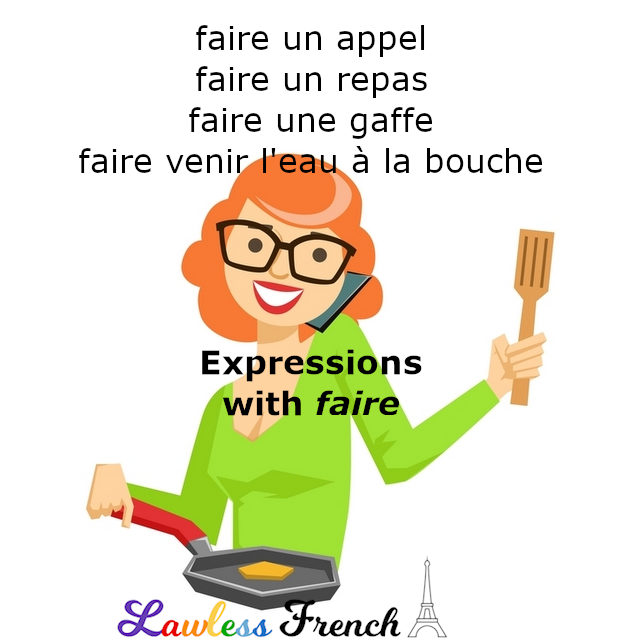 Faire is one of the most common and useful French verbs and has irregular conjugations in just about every tense and mood. 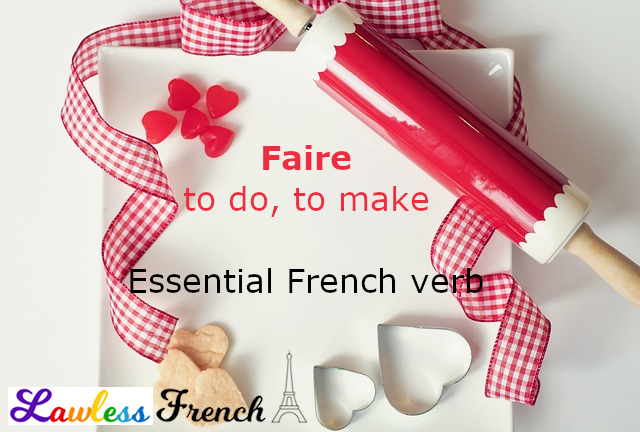 Faire literally means "to do" or "to make," but it’s also found in many idiomatic expressions and is the key to the causative construction. Je fais la vaisselle. I’m doing the dishes. Je fais le lit. I’m making the bed. Que fais-tu pour le déjeuner ? What are you making for lunch? 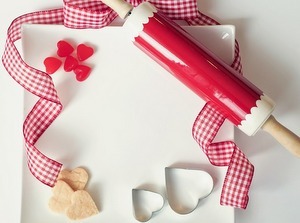 "Make" with an adjective is equivalent to rendre, not faire: That makes me sad = Ça me rend triste, not Ça me fait triste. More about this in a future lesson. "Make a decision" = prendre une décision, not faire une décision. Il fait chaud. It’s hot (out). Il fait 30 degrés. It’s 30 degrees Celsius. Un et un font deux. One plus one is two. Trois fois quatre font douze. Three times four is twelve. With the names of sports and other activities, faire is equivalent to the verb for that activity in English. Il fait du cyclisme. He bikes. J’aime faire de la randonnée. I like hiking. Faites-vous de l’autostop ? Do you hitchhike? Faire plus the infinitive is the causative construction: to have/make (someone) do (something). Je fais tondre le gazon. I’m having the lawn mowed. Il m’a fait pleurer. He made me cry. Does il se fait que need the subjunctive? * Difference between "do" and "make"
Regarding “faire” translated as “to be” in math, even in English, we sometimes say “one and one makes two,” so translating “faire” as “make” for math still makes sense.